Some say men, but I say no, women got the men like a puppet show. That’s right the women are smarter, the women are smarter that’s right. He said “I can’t do what the big boys do”, the man sat down and he cried too. One of my biases is that most people suffer from confirmation bias. They have their strongly held beliefs and look for ways to confirm what they believe versus seeking ways to challenge them by seeking contradictory evidence. It’s particularly acute and toxic in the realm of politics and also when it comes to social issues. I’m wading into dangerous waters here but with all of the news about the Google employee who was fired for writing a 10-page manifesto against Google’s attempts at social engineering through its diversity programs, I thought I would share some thoughts and data. I read the manifesto and I found a lot of it that makes sense to me. I’m not sure about the solutions but I thought I would highlight some things he pointed out that resonated with me and pull in some outside data that I think may have helped his case more if he used similar data. Since I am a believer that most people suffer from confirmation bias, I would expect most readers to see what they want to see in this post. If you’re offended by what he wrote, then the data will be discarded or discredited and if you agreed with him then you will see the additional data as more confirmation that he was correct. The author makes the case that Google discriminates against those with right-leaning points of view and that the diversity programs is embarking upon are pointless and counterproductive because they assume that there is bias against women with regard to engineering and other technical jobs versus asking whether their underrepresentation is a byproduct of a relative lack of interest and desire to do those jobs due to inherent biological differences between men and women. He is not saying anything about competence but solely focused on interest. He also asserts that since there is no ideological diversification at Google they are hurting the company by shunning a meaningful percentage of customers or disregarding their needs and interests. Since ideological homogeneity is of deep concern to the author, it’s important that he describes the views of people on the left and right. These are the biases the author sees that people have based on their political affiliation. Those seem pretty accurate to me. Take a deep breath, relax a bit, review the list, and see where you fall and then line that up with how you typically vote and then you decide if it passes the smell test. I consider myself pretty independent so I’m not surprised that I have traits that fall into both camps. The last verse in the song quoted at the beginning is a great example of someone who is left leaning. Read it again and compare it to the Left Biases above. The author makes the case that women are underrepresented in engineering at Google because of inherent biological differences between men and women. My personal belief is that the human species is designed to perpetuate its survival. This means that it must reproduce and this biological need to reproduce creates inherent differences between men and women so they can become attracted to each other so reproduction can take place. And after reproduction, children must be nurtured, raised, fed, educated, and supported which often requires a division of labor to effectively do this. Women are unquestionably more nurturing than men. Hence more differences. If you have a left bias then perhaps you think I’m sexist and if you have a right bias then maybe pragmatic. To me, it is just what is. The author of the manifesto seems to take a similar point of view. The author makes a number of assertions that I reproduce (pun intended) below. The last one seems a bit harsh and I would like some supporting data for it. The others seem to make sense given my experience but I would ask women, readers, to read the bullet points as objectively as possible and ask yourself if you think they’re true. Don’t ask what your feelings are telling you but ask yourself if you think they are accurate descriptions of women. And of course, my male bias is showing through by asking you to discard your feelings. Neuroticism (higher anxiety, lower stress tolerance).This may contribute to the higher levels of anxiety women report on Googlegeist and to the lower number of women in high-stress jobs. Status is the primary metric that men are judged on, pushing many men into these higher paying, less satisfying jobs for the status that they entail. Note, the same forces that lead men into high pay/high-stress jobs in tech and leadership cause men to take undesirable and dangerous jobs like coal mining, garbage collection, and firefighting, and suffer 93% of work-related deaths. Men are definitely very status-centric from my experience. Much of our self-worth is tied to what we do and the authority we wield versus who we are as holistic human beings. Whenever I want to gain some clarity when it involves an emotional issue like gender differences and corresponding employment differences I like to turn to data. In corporate America women still, make up a relatively small percentage of the top executives. 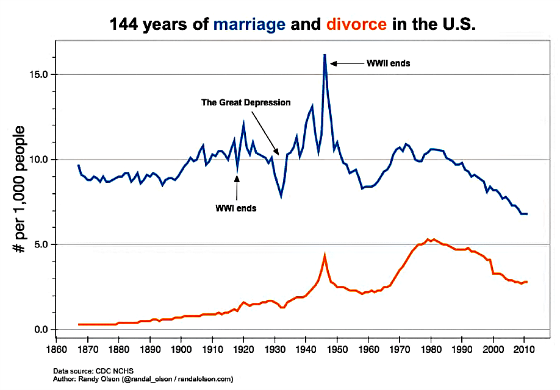 This is particularly the case for tech companies as the following chart shows. 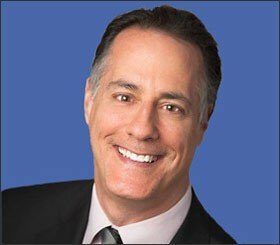 A left bias person would chalk it up to discrimination while a right bias person would say that there are many other reasons such as women leaving the workforce to raise kids, the desire for a more balanced life, not having their entire self-worth wrapped up in their career like it is for many men, etc. And there may be some discrimination too but it’s not the entire story. To dig down more deeply let’s look at educational statistics to see how men and women differ. 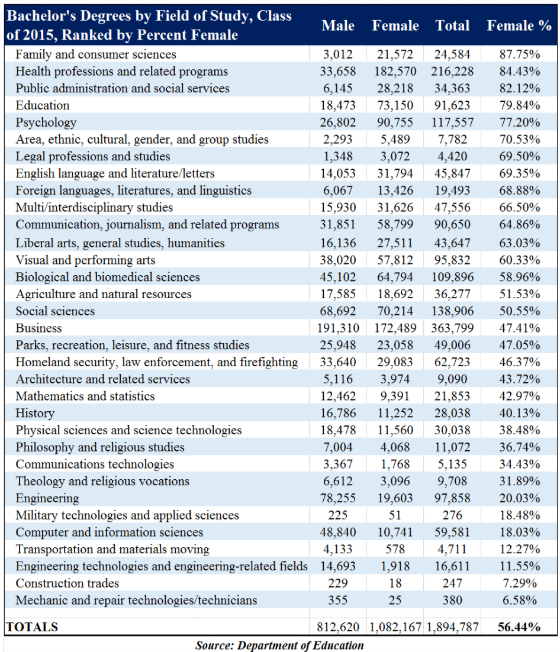 The following table shows the percentage of bachelor degrees by major went to women in 2015. Now that Google is in the media spotlight for one of its engineer’s diversity memo, it’s interesting to note that the female share of computer science degrees (18%) is about the same as the female share of Google’s tech jobs (20%). And the female share of Google’s not-tech jobs (48%) is about the same as the female share of business bachelor’s degrees (47.4%), assuming that a business degree might be the most common college degree required for those positions….Note the wide variation in degrees by gender shares. 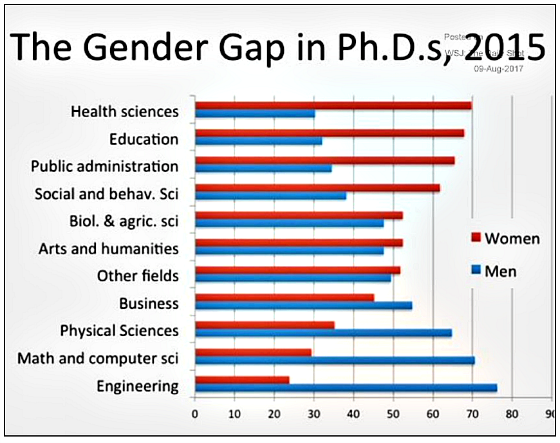 Women earn the large majority of degrees in health professions, psychology, education, English and communication, and men earn the large majority of degrees in engineering, computer science, and theology. I have to throw in an apartment plug here. 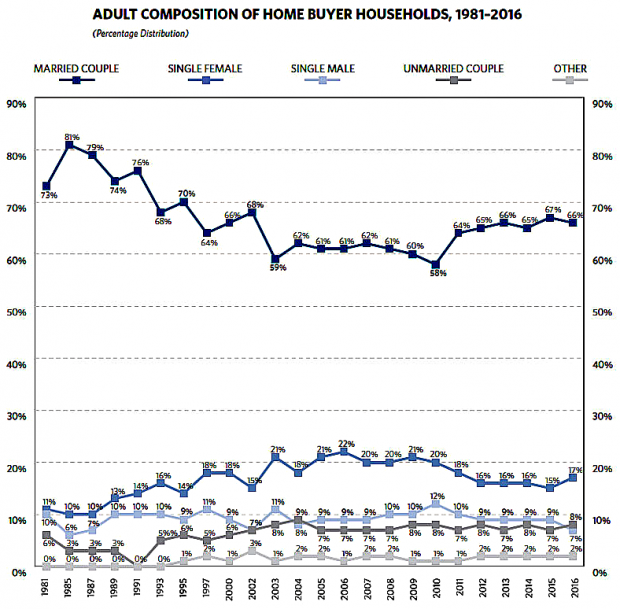 One of our contentions is that the large and growing disparity between college-degreed women and men will have the unintended consequence of keeping the marriage rate lower than would otherwise be the case as women choose to stay single versus “marrying down” and this would be good for renting as married couples make up approximately 66% of home purchases as the following graphs show. Overall, women earned 56.44% of all bachelor’s degrees in 2015, which means there were 130 women graduating from college that year for every 100 men. Women now have an uninterrupted 35-year record of earning the majority of bachelor’s degrees in the US that started back in 1982. Women earned about 59% of degrees in biology, which is one of the fields in the STEM area that we hear so much about in terms of female under-representation. And actually, if you include health professions as a STEM field, women earn more STEM degrees than men. Or if you count biology, mathematics, and physical sciences, women earn a majority (53%) of those degrees. It’s really only when you include engineering and computer science that men have an overall majority of STEM degrees. I think women add tremendous value in whatever fields they want to enter, engineering and computer sciences included. I do think the manifesto author is asking the right question as to why women are underrepresented in those disciplines. Perhaps you don’t agree with his hypothesis that it stems (pun intended) from biological differences. Whatever it is, this has been a persistent trend for decades so to chalk it up entirely to discrimination is a cop out in my opinion. The next question that people should want to ponder is why there are such substantial and persistent disparities in educational and career choices between men and women within certain disciplines. I’m of the belief that these are choices being made versus self-selecting out due to fears of or experiences with discrimination or overt barriers. You may say that’s my bias, I would prefer to categorize it as my working hypothesis. Oh, Father. The big differences between men and women are not due to biology but rather condition! As de Beauvoir puts it, “One is not born, but rather becomes, a woman.” Women were once seen as docile and inherently unintellectual and thus prohibited education — but could we not trace this “inherent” quality to the lack of education itself? (Even de Beauvoir’s father proclaimed that “Simone thinks like a man!” though thinking like a man translated to thinking at all!). As such, women were empirically weaker than men, but the condition of Woman was empirically different and would seem almost absurd to us now. Our own contemporary views of women will probably seem absurd very, very soon, believe it or not. That being said, these diversity initiatives only reinforce to us that the optimal path to success is through tech (the technocrat, as seen through Elon Musk and Mark Zuckerberg, is the undeniable future). It’s a facile way of saying, “Everyone is included at the party!” But in the same way, even our women and minority politicians are only subsumed into the modern cacophony of politics (they are just as sleazy and do little to change the system they benefit from), we are hurtling toward a tech-based future that cares little for the actual individuals that comprise it. Will it even matter who makes our latest gadget once it has come to bog down our lives like Facebook has? So basically: it’s the system, man. Oh my word! LOVE this post…so much to consider. I’m with you, Ariella –CONDITION! Muchas gracias, Gary and Ariella! Nicely said Ariella… clear and to the point! Well, James Damore (and other conservatives like him, who hold unpopular opinions about sexual differences) are not “included” in the tech party. Damore was fired. Isn’t the point of this controversy that diversity of opinion is punished? It has nothing to do with the merits of his argument. 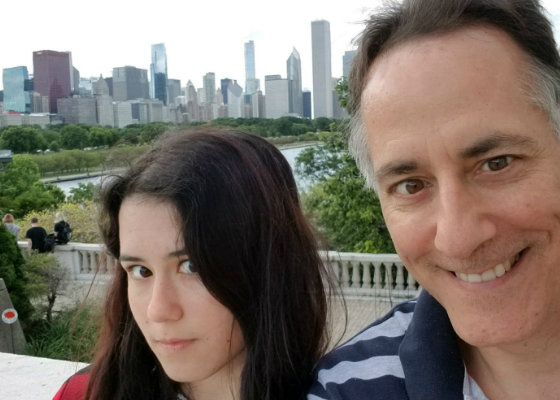 I like the fact that an intelligent, successful, open minded father assigns value to and is willing to consider his daughter’s observations and ideas…and share this discourse with the rest of us. It’s the journey, not the destination, that sharpens the sword. Kudos to Gary and Ariella!